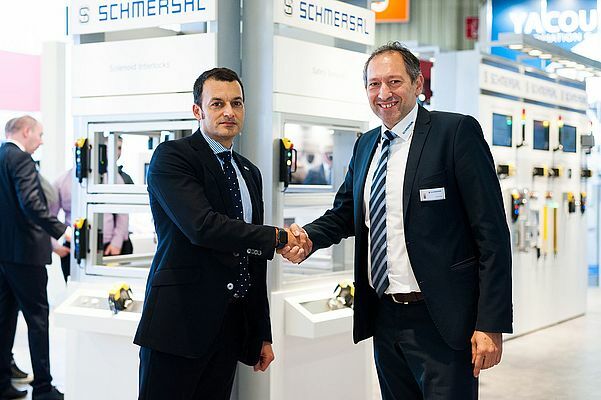 The Schmersal Group and Satech Safety Technology have entered into a global sales partnership. The product ranges of the two companies complement one another perfectly, meaning they can now offer complete systems to protect people and machinery in industrial production. Schmersal primarily develops and produces solenoid interlocks, safety sensors and safety controllers to keep guards safely closed which protect operating personnel from dangerous machine movements. Satech focuses on developing and producing modular safety components such as safety fences, doors and accessories. The Schmersal Group also offers its customers a wide range of safety services and is represented with production sites and sales companies all over the world, besides Europe especially in North and South America, India and China. With its patented mounting systems and a customised design software based on Inventor® and Autocad®, Satech develops tailor-made safety solutions for individual customer requirements and for different industrial sectors. Due to a large inventory of standard parts, the company can guarantee fast delivery even with large orders.